Now, I'm not a complex man. Like any hot-blooded American I like red meat, cold beer, and boardgames that involve warriors battling it out for gold and glory. But I also like a little complexity to my warriors, and prefer a boardgame where the characters level up over the course of game. So you'd think games like Talisman would always fit the bill perfectly. In Talisman you travel around the map, battle monsters, pick up gold and magic items, gain Strength and Craft, and eventually make your way to the inner circle through the Valley of Fire. There you try and win the Crown of Command so you can rule the land of Talisman under an Iron Fist for the rest of time. What's not to like? Now Ramond Cameron is a hobbyist who knows how to adventure. 3-D Talisman! Check Ray's stuff out here. I'll admit it, I've been lax on game-blogging. 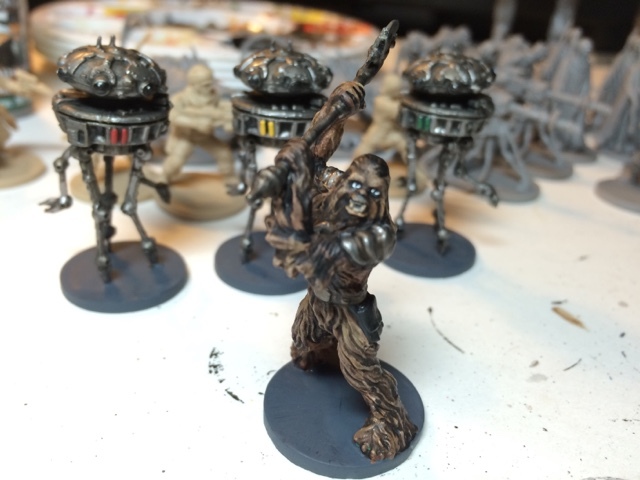 Not only that, I've been turning down game invites and haven't been painting as much as I'd like. But I have a good reason! 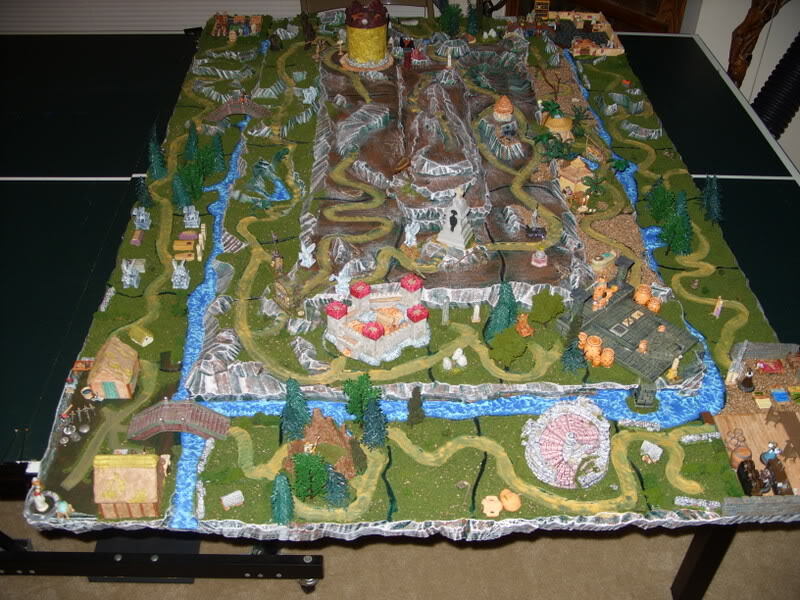 I've been secretly working every evening on the greatest boardgame ever to grace the halls of humanity. Its something I've worked on in complete secrecy, because if established game designers learned of the majesty of our deck-building boardgame mechanism they would steal it from us in a heartbeat. That's right, I said us! I have secret partners in this project. Artists, photographers, marketing agents. Partners based around the world working to create the finest Sword and Sorcery game ever to grace tabletops of the world, ever since the majesty that was Dark Tower. Assault on the Tower of Madness! - Located in Lake Geneva, WI, which is the birthplace of D&D. I don't usually run anything at GaryCon, as its the first convention of the year I attend to purely game around the old guard without having to worry about toting around minis and terrain. Plus all the relaxed gaming helps prime the creativity-generator for new campaign ideas for the rest of the year. - This is the personal convention I put on annually in Madison, WI, which usually hosts about 15 members (one or two new attendees are invited each year). I send out puzzle invites a couple months before the convention that the attendees have to solve. Here is where I first reveal any new games I've made up, and where the individual game production values can be maxed out (blacklights, dry ice, etc) because I am in total control of the gaming environment. - A convention put on by the illustrious Brando, master of running the all-weekend MEGADUNGEON! He runs a weekend-long convention full of various physical challenges for the attendees on Friday through Saturday morning. Winning these challenges translates into rewards and magic items one can take with them into his 10-hour long megadungeon session starting on Saturday afternoon. I couldn't make it last year because I was officiating a wedding (fun fact: State law allows level 10 DMs to marry people in Wisconsin), but I've been lucky enough to be invited back this year and am looking forward to once again facing the numerous deathtraps in the caverns beneath Waterdeep! I also might try and run one of my RPG events there before the Megadungeon starts. - Nexus takes place in Milwaukee, WI, everyone's favorite previous home of GenCon. I was invited there last year to run my He-Man vs. Cthulhu RPG event, and met a lot of really cool folks. This time they've asked me to come for the whole weekend and run more of my RPG events (Back to the Future, Tron, etc), which I'm going to try make work. It doesn't hurt that this year Nexus takes place over Memorial Day Weekend, giving an extra free day off from work for gaming! - Ah the giant mega-con of them all. Bloated and simmering in its own dominance. GenCon is a must-go to for many folks, but for me its allure has really started to fade. Its become so huge and ComiCon-like that its lost a lot of the luster it once had for me. The past few years I've just gone for mostly True Dungeon, but with Gamehole Con getting TD that's less of a concern. Nevertheless I'm going to try to make time for it this year and try to recapture the spark. I've never actually run anything at GenCon because I have to cart around so much stuff to run them properly. They are also not cool with people bringing in laser pointers or coolers of dry ice and sublimating it at the gaming table, so I don't push the subject. Conventions! If you've never been to one I recommend trying one out! They are a great place to meet new folks who happen to be exactly like you, or to meet other weirdos who are nothing like you but are fascinating to talk to. Either way just about everyone is nice to each other because they're all there to game! There. Just completed 100% on Batman:Arkham Knight. Collected all 243 goddamn Riddler trophies, threw the last of the major criminals into GCPD lockup, and activated the full KNIGHTFALL ending cutscene. Hopefully now I can try actually enjoying this game. Let me explain what I mean. 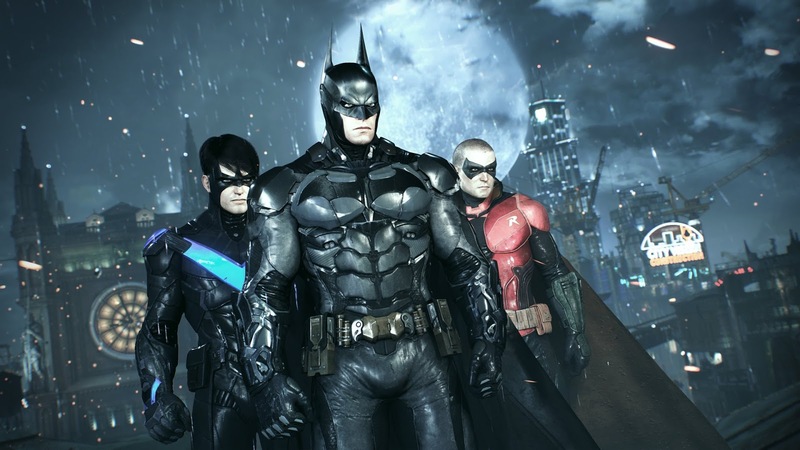 The Batman Arkham games are beautiful graphically, and have pretty good plotlines, and (except for the forced Batmobile-tank parts of Arkham Knight) have great combat and exploration mechanics. They really make you feel like you can play as Batman, but that's only AFTER you've actually completed the game. You gotta earn it, son.